The world’s largest drive-in restaurant is famous for food with heaping helpings of nostalgia and entertainment served on the side. It is not just a greeting. It is an Atlanta anthem, one that brings smiles and fond memories flooding back to so many. 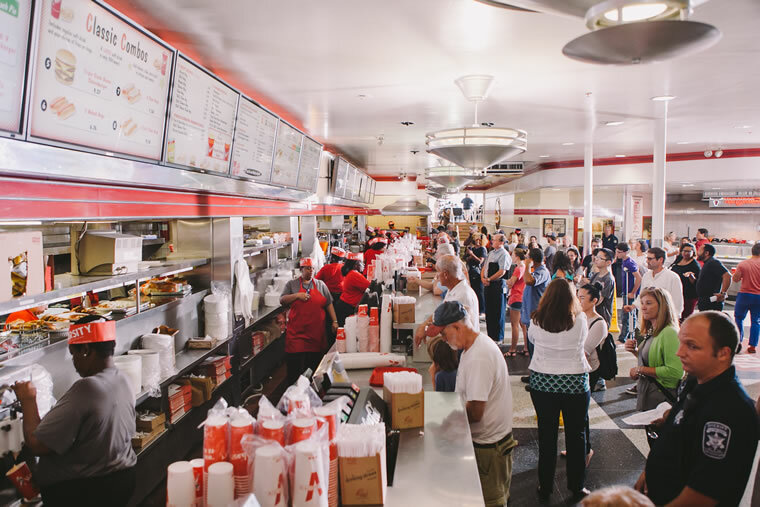 It’s the barking call of the jovial counter workers as masses of hungry customers step up to The Varsity’s long stainless steel counter to place their orders. For 90 years, folks have flocked to The Varsity (known to regular diners simply as “The V”) before Saturday afternoon football games or any time they find themselves nearby and can’t resist the mouthwatering aroma wafting through downtown. The V beckons them to pull off the interstate and enjoy the finer things in life, like a hot dog, all the way, with a side of strings and an F.O. For those unfamiliar with the landmark, don’t mistake The Varsity for a mere fast-food restaurant. It’s so much more—it’s an experience that must be savored. The lunch crowds reach epic proportions. Consider this: The Varsity serves an average of 15,000 people every day, and on the busiest days, it serves 30,000 ravenous customers. Her father had been grooming older brother, Frank Jr., to eventually take over the business, but in 1980, an accident that claimed her brother’s life changed everything, including Simms’ career trajectory. A country boy from Middle Georgia with an interest in engineering, Frank Gordy enrolled at Georgia Institute of Technology and started taking classes. According to Weiser and other family members, soon after Gordy left school, he and his brother visited Florida and saw something they’d never seen before—small restaurants with walk-up windows. That’s when it clicked. From his semester at Georgia Tech, Gordy knew that the students were starving for fast, affordable food. He believed that if he built a drop-by type of eatery in the school’s vicinity, the students would come in droves. Armed with his “million-dollar taste buds” and an innovative business plan, Gordy launched a small operation just off of campus near the intersection of Luckie Street and Hemphill Avenue, where he sold hot dogs for 5 cents apiece. Looking to capture some of the foot traffic from the nearby trolley stop, the young entrepreneur leased property on North Avenue and constructed a small brick building that housed a six-stool counter and a walk-up window. When Gordy left Tech, he told his two roommates that he would be worth $20,000 by the time they graduated—instead, he was worth $40,000. And while he never went back and finished his engineering degree, he designed his own conveyor belt system and production machinery. One invention could produce 2,500 pies in a single hour. It’s still in use today. 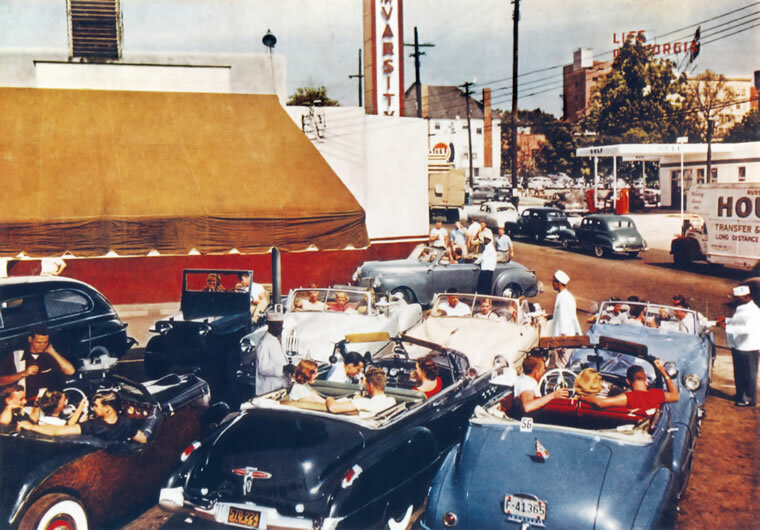 While the drive-in itself may not look so big today, in the 1950s and 1960s, 90 percent of The Varsity’s business was done on the curb. It was known as the World’s Largest Drive-In. The lot was so busy that a control tower and a PA were used to direct heavy traffic. The Varsity employed more than 100 carhops back then, and one earned an astounding $12,000 in tips in a single year. By the 1970s, dining preferences had shifted, and most of the diners had moved inside. Only 50 carhops remained on the payroll. Gordy reacted by expanding the capacity of the dining areas to accommodate 650 customers. Atlanta was booming, and when the city needed to widen the Downtown Connector, it acquired part of The Varsity’s footprint. Gordy and family adapted again and kept moving forward. In the 1980s, Gordy’s daughter added salads to the menu, decided to stop selling beer and built an indoor restroom for women. In 1990, the family opened another Varsity in Gwinnett County, Georgia. 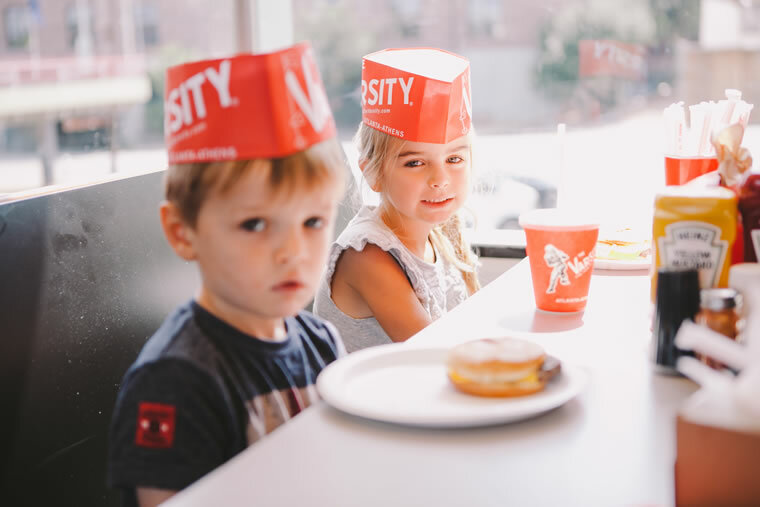 Today, The Varsity boasts five locations in the greater Atlanta and Athens areas, two satellite shops at Hartsfield-Jackson Atlanta International Airport and catering trucks. It remains a family business, and multiple family members participate in day-to-day operations and feel honored to be part of tradition. Gordy and family have continuously pushed through the myriad changes over the years and have proven to be infallible in their mission to provide quality food offered at affordable price points, with heaping helpings of nostalgia and entertainment served on the side. Other customers remember seeing The Beatles on “The Ed Sullivan Show” or the solemn news coverage after the assassination of President John F. Kennedy. And Simms recalls the busy times during the 1996 Summer Olympics held in Atlanta, noting that the Olympic Village was just across the interstate from them. A unique parallel exists between Sea Island and The Varsity. Both have become part of the fabric of families—the experiences and traditions passed from one generation to the next and the next. “Before Ocean Forest Golf Club was developed, my grandfather would take us fishing there,” Gordon Muir, The Varsity president, recalls. “We’d get a key to the gate from an office at The Cloister and disappear for a while. We’d eat our suppers there and fish. 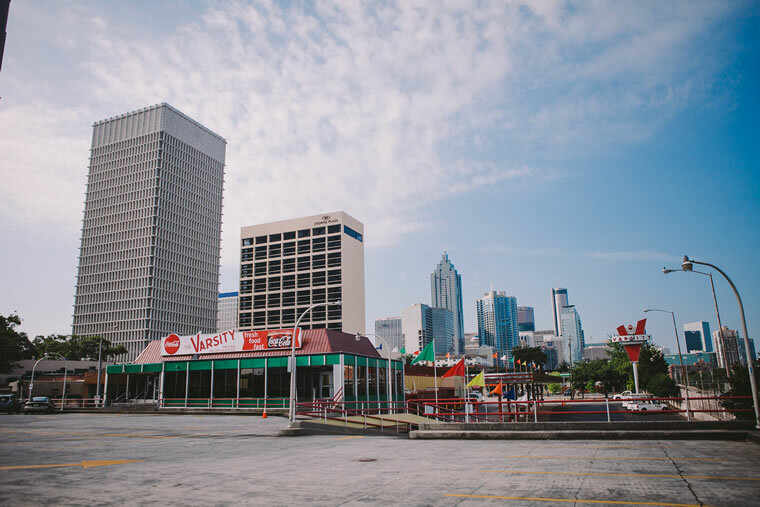 • The Varsity in downtown Atlanta serves, on average, 15,000 people per day and up to 30,000 people on its busiest days. • If you lined up all the hot dogs The Varsity serves on an average day, they’d stretch over 2 miles. • Each day, The V serves about 2,000 pounds of onions (onion rings), 300 gallons of chili, 5,000 fried pies and a ton of potatoes (french fries). • The Coca-Cola Co. attributes The V to selling more Coke products than any other single restaurant in the entire world.